Ontario Bakery: All You Need to Plan a Fun Pirate Birthday Party! Who doesn't love a pirate themed Birthday Party? At Ontario Bakery, we make a lot of pirate themed cakes, so we know it's hit! 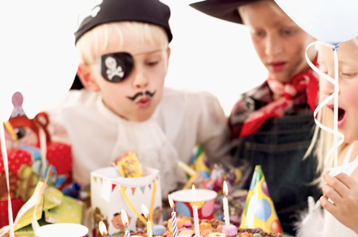 That got us to thinking, that's we'd love to share some of our favorite pirate themed birthday party fun with you. So here, you go. Here's all you need to plan a fun pirate birthday party! Have fun making your own invitations using a fun font, like Old English and print it out on parchment paper or brown card stock, to get a light and antique feel. Tear each invite into squares for rough edges. You can even roll or crumble it up to give it a really authentic look. Place them into envelopes with a red stamp or seal on the back. Kids will love opening these up! Create a treasure table center piece. Spray paint a small chest, and other treasure items like goblets and vases. Place decorative items, gold chocolate coins and costume jewelry in and around the chest. Drape fishing nets in the main party area and swirls of blue fabric to represent the sea. Place starfish, crabs and fish in net -marine bath toys are ideal. Wine barrels, chests and a skeleton would also add to the ambience. Walk the plank: Set up a plank or balancing beam for the pirates to walk along. Use pillows or gym mats to break the fall. Award prizes for the pirates who make it across. Black beard: Choose some brave pirates, who are then blindfolded, and told that a famous pirate is coming to visit. The blindfolded pirates feel the stump of a leg (an adults knee), a whiskery beard (a broom) and then the missing eye (an open tomato). This game is not recommended for guests who are easily scared but it is a whole lot of fun for pirates who like adventure. Pin the patch on the pirate: Create a pirate face or use a “Pirates of the Caribbean” poster to pin on the missing patch. Message in a bottle treasure hunt: Create two teams and give them a plastic bottle with a scrolled treasure map inside. Each team follows the clues and map to find the treasure. Face & body decorating: Apply beards and adhesive tattoos! Or get out the face paints and "tattoo" skulls, parrots and boats on their arms! Isn't the food the best part? It's definitely our favorite! Call us and we'll make a pirate face birthday cake or pirate ship cake just for you! Watermelon basket - Cut a watermelon in half and scoop out small balls of watermelon using a fruit scoop. Place watermelon balls into the basket and serve. "Fish and chips" (or fries!). Serve up some fruit punch served in plastic wine goblets! As you can see, there are so many fun ideas to be had! We hope your pirate party is an absolute blast! Don't forget to call Ontario Bakery for all your custom pirate cake needs!